Cellphone calls from airplanes? Hell, yes! Fresh on the heels of the FAA lifting the ban on using inflight electronics during takeoff and landing, the FCC thinks it's high time we should also be allowed to annoy the living f&%k out of everyone on the plane talk freely throughout the cabin -- on our cellphones! Sounds hellish, right? We thought so too, at first. But then we started thinking of all the awesome reasons we're excited about cellphones on planes. Here are 20 worth taking into consideration. 20. Ever been flying West, caught a gorgeous sunset out the window, and thought, "I should totally let someone in California know how red the sunset's going to be so they can Instagram the hell out of it!" Well, now you can. 19. You know how you love the sound of that old rotary phone ring tone so much? Imagine three hours of it, coming from every corner of the plane. Sweet music to your ears! 18. Why settle for Sbarro (or airplane food in general) when you can order your favorite local pizza en route, and have it waiting at the airport when you land? 17. "Dude, I'll give you C.J. Spiller and Kenny Britt for Jamal Charles. What? No man, that's totally fair!" Yep, you've got an entire flight to talk trades and debate start-sit decisions. 16. You can Tinder chicks on the plane. That's how Tinder works, right? You just Tinder chicks, all flight long. 15. You have friends coming to visit next weekend, but (oh no!) your guest room bed is embarrassingly short of comfortable throw pillows. If only there was a way to call your GF to remind her to stop by the Jean Claude Penny. Now there is! 14. If you've said it once, you've said it a thousand times: there just aren't enough altercations on airplanes these days. Get ready for Pacquiao vs Mayweather on every other flight. And you'll have a nice ringside/ aisle seat. 13. Because you've always been one to learn by osmosis, imagine all the sweet business knowledge you're going to soak up listening to that toner cartridge salesman work over his clients in Topeka. Or, better still, cold-calling new ones!!! 12. "Well, isn't this the most handsome-looking garden gnome with built-in kegerator and toiletries dopp. Where is that SkyMall 800 number?" 11. Planning to join the Mile High Club? It's way easier now -- text (or call) her "come to the bathroom now" once you've scoped the lavatory line. 10. Tweet that awesome pic you just took of the wing in real time. And the seat. And the traytable. And the seatbelt. And DUDE, the bag of peanuts both before and after you opened it. Unlimited data plans rule. 9. You and a buddy are both watching Looper, but you're seated several rows apart. And you have a question about why Bruce Willis and Joseph Gordon-Levitt just don't team up together (which makes total sense considering anything that happens to JGL also happens to Willis in the future. Are we wrong here?). Call and discuss. 8. You could stand shivering in that long taxi line, or you could call mid-air and have an Uber car waiting upon arrival. That's LIVING!! 7. Why wait until you get home to tell your bros what an awesome time you had in Vegas? You've got, like, five hours to walk 'em through the entire night at the Hard Rock Casino. Let's settle in. 6. 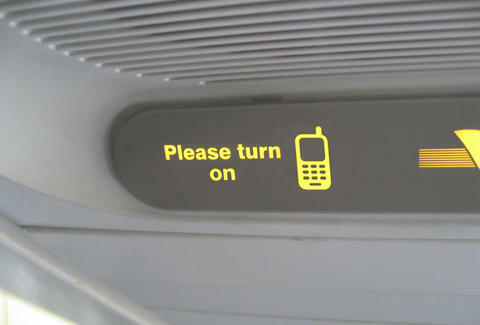 For cellphones to work in-flight, airplanes will require a special hotspot-like transponder to relay the calls. If we're lucky, the generous-and-never-opportunistic airline bosses'll figure out a way to charge crazy outrageous ancillary fees in order to join the party. Fingers crossed! We love parties. 5. Does the attractive brunette sitting next to you refuse to acknowledge your existence? Perhaps she'd think otherwise if she "overheard" a call between you and your stock broker? Casting agent?? Dental hygienist??? 4. You can call the pilot and, for once, legitimately interfere with the plane's navigation. 3. You thought the flight attendant who cracked a cold one before jumping down the inflatable escape slide was "The Man"? Wait until a flight attendant straight-up murders a dude with a plastic spoon after suffering through his updated address information. For the eleventh time. Now that's what we call "in-flight entertainment". 2. Admit it -- if there's one kind of story you could listen to for hours, it's the, "OMG!!! I totally met this hot guy at the bar last night, and we hit it off, like, soooo much. When do you think he'll call?". Classic. 1. You'll finally be able to bet on sports while the games are in progress (or already over) and win HUGE amounts of cash. Wait -- that's actually time travel. Never mind.